8 Million persons were affected by the 2015 earthquake in Nepal. In Norway we heard about on the news that the Gorkha Earthquake killed nearly 9000 persons. 3570 of the persons who lost their lives were in Sindhupalchok district. People lost their houses when the earth shook at 7.8 magnitude on April 25. 2015. It was a Saturday. Two weeks later another earthquake followed at 7.6 on May 12. 600,000 houses were destroyed. 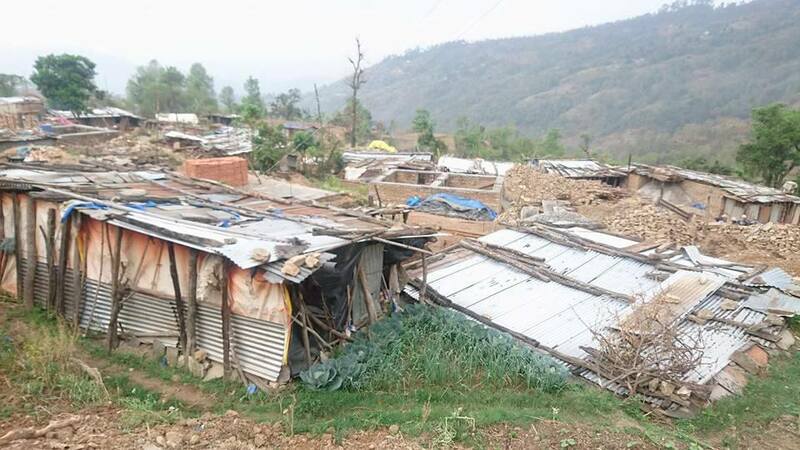 In Sindhupalchok alone over 6000 houses were completely and partially destroyed. Close to 90.000 houses were affected. The earthquakes had an immediate effect on people´s lives. Life stock died, school buildings collapsed, government and health buildings were damaged, and water supplies were damaged. People´s everyday lives were shook up. Balloons sent up into the Oslo Skyline next to National theateret symbolizing solidarity with Nepal on the occasion of Dugnad for Nepal Telethon. Photo by Kathrine Olsen Flaate. In Norway we raised funds, in Nepal Red Cross provided relief. White balloons were sent up into the Oslo skyline in solidarity with those affected by the earthquake. A tear-filled concert reached into the living rooms of Norwegians on TV´s across the country. The Telethon collected humanitarian funds for the emergency response in Nepal. In Norway we fundraised and sent aid. In Nepal persons who have now become our colleagues and friends felt the earth trembling under their feet. Shortly after, they were back on their feet to contribute with emergency relief. And our colleagues are still contributing with reconstruction and rebuilding both houses and communities. Reconstruction and rebuilding does not happen over night. Visiting one of the most affected districts Sindhupalchok through Norwegian Red Cross, we saw damaged houses standing next to temporary housing. Work still remains to be done. And work gets done by the Red Cross. Holistically. Reconstruction and house building is combined with work training. One earthquake safe house is built in 50 days by six persons. At the same time the house-builders become trained masons. One house built for one family contributes to that five other families gets one breadwinner. It is not only house building that is needed to rebuild communities after the ground shook up life as it used to be. Several families also lost their livelihoods, as their animals were killed and fertile agricultural land destroyed. Therefore rebuilding of houses and WASH projects of goes hand in hand with on the job trainings and cash for work.